Using Computational Fluid Dynamics analysis to reduce our time "back at the drawing board"
In almost every development process, multiple design iterations are unavoidable. Optimizing an air flow system in a single iteration is rare. In fact, some projects require three or four design loops before the targeted air flow is met. In 2009, ebm-papst Inc. set out to find a way to minimize these steps and thus reduce development costs and get projects to market more quickly. The answer was Computational Fluid Dynamics (CFD) software. Optimizing air flow systems during development can be challenging. Before ebm-papst introduced CFD to our development process, we would fabricate an initial prototype design using knowledge gained from previous projects. After testing it in the lab, we would compare the results against the air flow, efficiency and noise targets defined at the beginning of the project. In an ideal case, the results from the first prototype would meet or even exceed the targets defined for the project. But typically, the prototype would not exactly meet the targets, and we would move on to a second design. Each new iteration would require engineering time, material costs to fabricate another prototype and lab time to test the new version. Run numerical simulations of the flow field in a system using relatively basic CAD geometry to define the system. The software predicts the air flow through the system, determines the pressure drop, and helps identify problem areas in the flow field. It also looks at heat transfer to determine if critical components are being cooled adequately by the flow through the system. Simulate various designs to determine the optimal one for that specific system. CAD models for each design modification are created. Run those simulations simultaneously, often times after hours so the data is available the next morning. The various design options can be directly compared to determine which characteristics provide the best results. 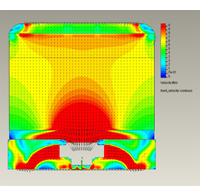 CFD simulations don’t eliminate the need for experimental data. We still must build and test a prototype in the lab to verify that it meets the design targets. And we still use our knowledge from previous projects – but now, a characteristic can be simulated in the new system to see if it is beneficial. The simulations allow us to quickly narrow in on an optimized design. The addition of CFD analysis to our capabilities has been a tremendous asset, and is just another example of how ebm-papst is constantly investigating and innovating to offer more efficient processes and solutions to our customers. To learn more, contact sales@us.ebmpapst.com.